British Prime Minister David Cameron lost a vital parliamentary vote on Thursday night meant to pave the way for Britain to join a looming military strike on Syria, in a move that appeared to all but rule out British involvement in such action. 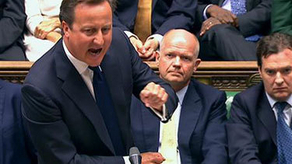 In a humiliating and unexpected development, Cameron and his coalition government failed to pass a motion that would have authorized military action against Syria in principle by 285 to 272 votes. Cameron said afterwards he would not override the will of parliament and approve military action, saying it was clear that lawmakers did not want to see a military strike on the Syrian government to punish it for an illegal chemical weapons attack in the suburbs of Damascus last week. "I can give that assurance. I strongly believe in the need for a tough response to the use of chemical weapons, but I also believe in respecting the will of this House of Commons. "It is very clear tonight that while the House has not passed a motion, it is clear to me that the British parliament, reflecting the views of the British people, does not want to see British military action - I get that and the government will act accordingly."